Happy World Card Making Day! Hope you are enjoying your day so far. You can find more details HERE. 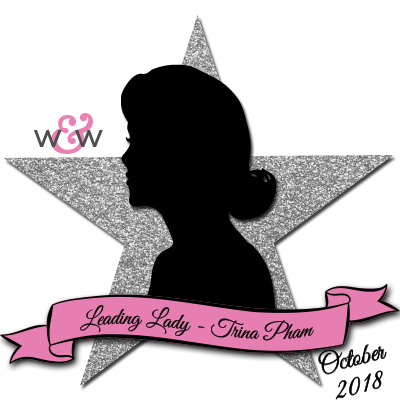 We have another awesome post for you today introducing our October Leading Lady Trina Pham! Trina caught my eye with the incredible cards she submitted to our challenges. Her cards are impeccably designed and executed with a flair for the dramatic and full of humor and cleverness. 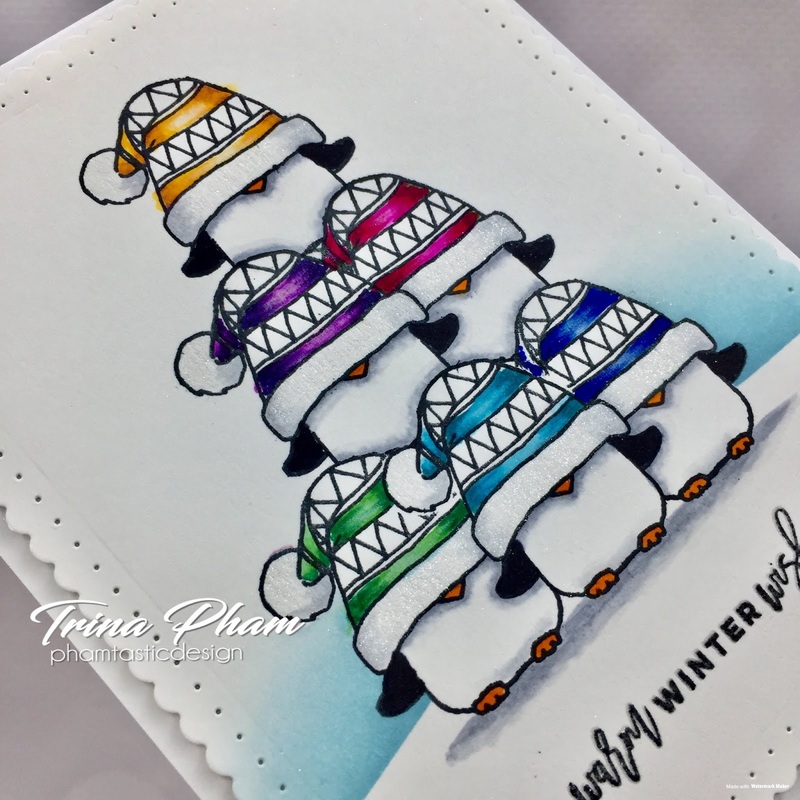 I am really excited to see what Trina will be creating this month as she takes us on an adventure of her own design on Saturdays in October on the w&w blog. Please give Trina a big round of applause to welcome her as she steps onto the stage for her first performance as our October Leading Lady! Hello there! Look who's the lucky Leading Lady this entire month at Winnie & Walter!? I KNOW!... oops, didn't mean to yell. Can you tell I am thrilled and excited? When I first saw the e-mail from Shay inviting me to guest design this month, I was shocked, ecstatic, overwhelmed and nervous all at once! I think I'm still in a little disbelief, but don't pinch me because I don't want to wake up from this amazing dream! 😜 I love their products and I am so honoured to have this opportunity. I hope you will join me every Saturday this month. So for my debut week, I am hash tagging it #favourites. My cards are mostly clean and simple (CAS), and masking is my favourite technique I use quite often to help preserve that white space indicative of CAS cards. I also love bright, cheery colours, so incorporating rainbow colours into my cards is another favourite. These two favourites are the basis for my cards today. First up is a rainbow birthday card. Birthday cards are needed all year round, and I make these cards the most. Started by trimming a piece of X-presss It cardstock down to A2 size. Stamped the cats from Purrfect with Evelin T Designs with black Copic friendly ink. Masked them, then die cut a reverse circle mask from masking paper using Big Round Balloon cutaways. Adhered the reverse mask over the cats, then white heat embossed the images from Dotty About You. Sponged Picked Raspberry, Wilted Violet, Squeezed Lemonade, Peacock Feathers, Twisted Citron, Tumbled Glass, Faded Jeans and Chipped Sapphire distress inks to create the fireworks background. Wiped off excess ink with a paper towel. For some sparkle, spritz with a DIY shimmer spray. Removed the masks, then coloured the cats with warm and cool grey Copic markers. The sentiment from Wishing You with Evelin T Designs were heat embossed. 'Wishing you' was black heat embossed directly on the panel and the rest was white heat embossed on a black strip. Adhered the panel to a white card base to finish. My second card is a Christmas card. Christmas is a my favourite season. I cherish the many fun festivities spent with family and friends. And no surprise, Christmas cards are my favourite cards to make. I am using my favourite critter penguin from Season's Tweetings with Evelin T Designs. In fact, I posted a card a few days ago with him. I didn't think he could get any cuter, but how about a whole group of him in a crittertree? This card is masking on steroids! *lol*😂 It is actually my second attempt because I smeared black ink on the first one. On Neenah cardstock and starting at the bottom with the middle guy, stamped and masked, working my way up to the top. Masked a slope next, then blended Broken China distress ink for the background. Removed all masks and coloured them in with Copics. Black heat embossed the sentiment from Sentimental Winter. For some interest, die cut the panel using Essentials: Audrey's Cutaways. Mounted with white fun foam onto a white card base for some dimension. Clear shimmer on the hat brim and pom-pom finished off the card. It was difficult to capture it in the photo. And as I was cleaning up, I had an "ah-ha" moment. The ink smear on the first one was in the background, leaving the crittertree untouched. What a shame to see all that stamping and masking go to waste. I fussy cut the crittertree out and create a bright and colourful non-CAS card. The rainbow background was created with Distress Oxide inks (Squeezed Lemonade, Picked Raspberry, Salty Ocean and Twisted Citron) on mix media paper. I used my favourite method and added a flurry of snow with a white gel pen. 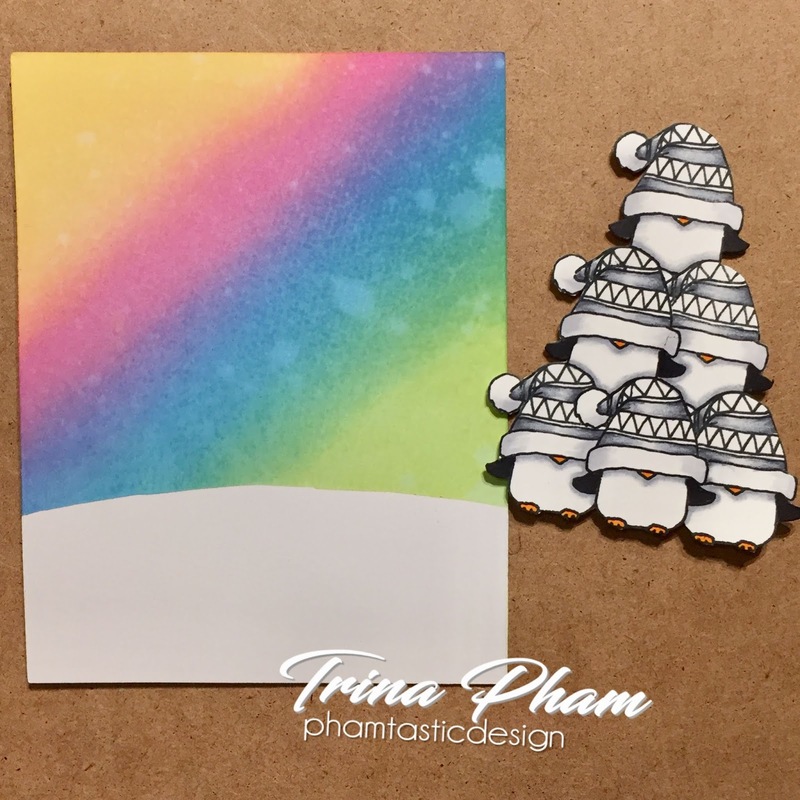 And just like that, I have two rainbow crittertree cards two ways! Shay has kindly offered up a $30 Winnie & Walter gift card for me to give to one lucky commenter on my blog Phamtastic Design. For your chance to win, leave a comment on this post and/or any of my leading lady posts and I will randomly pick a winner from all the comments left by October 31. That does it for me this week. As it is World Card Making Day (WCMD), I want to wish you happy WCMD! If you haven't done so, check out the challenges Winnie & Walter is hosting in celebration of this event HERE. Thank you for spending your time with me. Have a wonderful week. Amazing cards. I can totally see why Trina's cards caught Shay's eye! 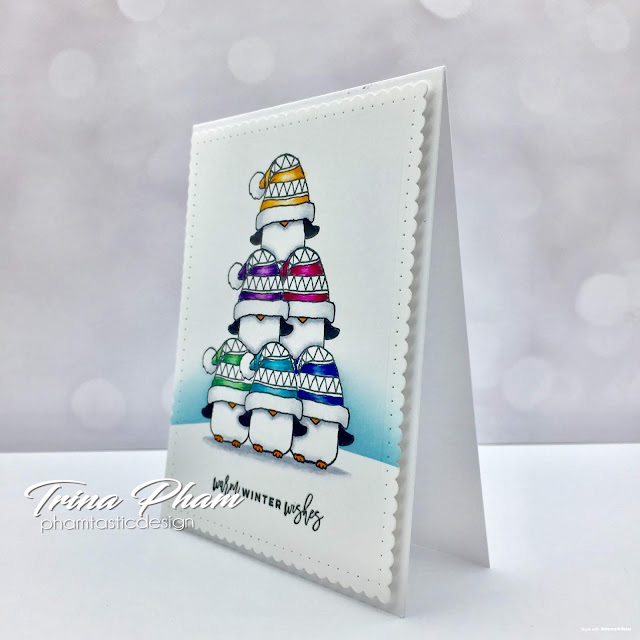 Happy World Cardmaking Day Trina ! I loved your cards,they are adorable. Shay, I'm absolutely thrilled to see Trina's incredible talent and abundant creativity showcased here! Here fireworks-and-kittens card is adorable and filled with birthday celebration. The penguin trees...OHMYSTARS! Absolutely ingenious and, as you mentioned, so beautifully composed! Whimsical AND classy! So happy she found a way to salvage her 'smeared' background; she certainly is one for design innovation! Trina is, indeed, a stellar Leading Lady! Loving those penguin tree cards the best! Fabulous cards! 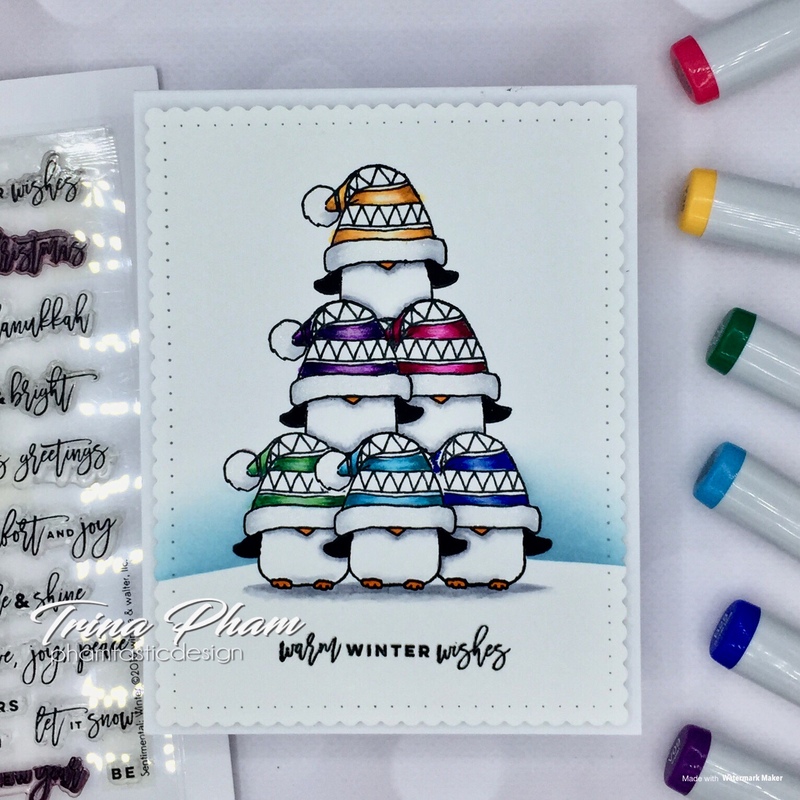 Love that cute penguin tree! Congratsion Trina , both of your cards are so cleaver, so excited to see more of your amazing creation through this month . These are all adorable!! I love the bright rainbow colors on all! Love these cute and colorful cards. Thank you for sharing your talent! These are awesome!!! WoW!! Your cards are fabulous, Trina! So clever with the colourful backgrounds really showing off the cute images! Thanks so much for the inspiration. Congrats on being the Leading Lady! Love your cards! Yay!! Congratulations Trina .. Wonderful cards dear ...love each one of them . I love the rainbow color hues on all! Fabulous and so inspiring! The first words that popped into my head when I saw your beautiful cards was 'good gracious!" I can't seem to pick up my jaw from the floor. AWEmazing and just stunning. Your cards are stunning! I love the vibrant, rainbow colors and the images are adorable. I can see why you're this month's leading lady. Awesome cards...love anything rainbow and you rocked it! Wow! I can already tell I'm going to be impressed with this month's Leading Lady projects!! Trina, your cards are so vibrant and colorful!!! LOVED the inspiration of all 3!! 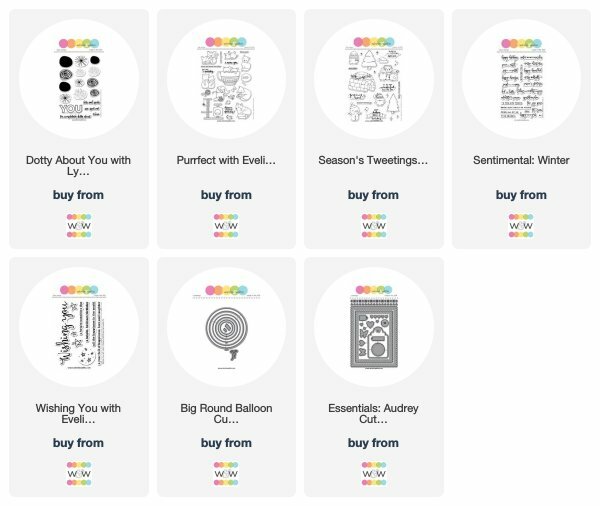 Also, that they will be so fun to use as inspiration and the cute penguin "tree" stamp is my fav!! Love the white gel pen added to the Distress Oxides especially!! Fun when things go wrong and yet lead us to even better results!!! Love that! Congrats on being the new Leading Lady, Trina!!! Love your gorgeous cards!!! Your cards are beautiful. Love the amazing backgrounds. Oh wow - love the penguins. Both backgrounds are wonderful and so festive. The hat down over their eyes made me laugh out loud! Trina's work has always inspired me, to see her as the leading lady is a feather in her cap. She is a queen of masking for me. Fabulous cards Trina! wow, your colours are incredible.